The author of Tales From Thunderboat Row is happy to pen a personal message for anyone who orders his new hardbound book. I’d have to go back to 20 years to my college days to read the last book review (for Pepperdine University’s weekly newspaper) or book report (for my Japanese Literature class, yes that was a class) I wrote. And while my column this week would qualify as a book review, it’s a little more than that since it pertains to the fun industry I cover on a daily basis. Plus I was able to interview the author, a friend I first met and got to know during my tenure with Powerboat magazine—although not nearly enough I realized after reading the 50-plus tales in Allan “Brownie” Brown’s new book. 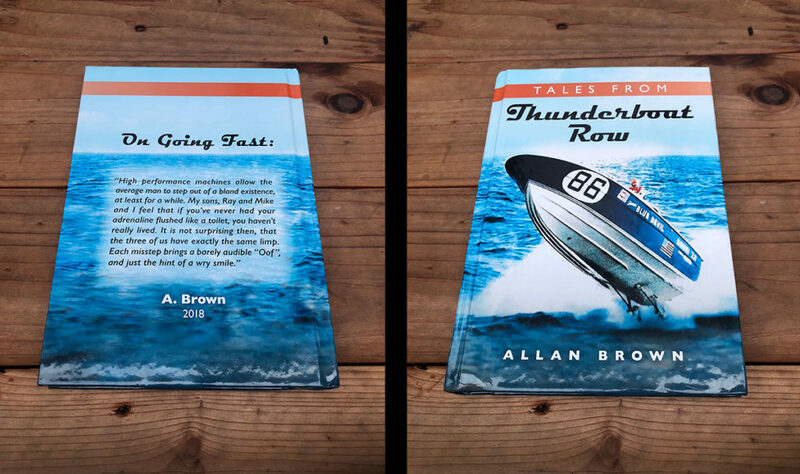 Accomplished boat builder and Hall of Fame offshore racer Allan “Brownie” Brown shares more than 50 stories spanning his 60-plus years in the powerboat industry in his new book, Tales From Thunderboat Row. The book, entitled Tales From Thunderboat Row, is just that, a collection of stories—some five or six pages long, some two or three pages long—of Brownie’s experiences in an illustrious powerboat-industry career that has spanned more than six decades and has crossed paths with everyone from Don Aronow, Al Copeland and John Cosker to Clive Curtis, Tom Gentry and Filippo Theodoli. His resume is extensive with influential boat design, building, supply and sales positions at companies such as Cary Marine, Challenger Marine, Cigarette Racing Team, Cougar Marine, Donzi Marine, Gentry Transatlantic, Nova Marine, Stainless Marine and many others. As many of you know, Brownie’s sense of humor is one of his best qualities and he doesn’t shy away from it in Tales From Thunderboat Row. That wittiness is why he’s known for his gifted storytelling ability, and it comes out loud and clear in the book. Fortunately for us, he took the time to put a lot of his stories into words. I can only imagine how many tales ended up on the cutting room floor, too. For a few hours over the course of a couple weeks after receiving the book, I let Brownie’s words and my imagination take me back to the wheeling-and-dealing Don Aronow days, some of the first offshore races such as Miami-Nassau in 1964 and building a Donzi for President Lyndon B. Johnson’s private lake. It is a fun read, for sure, with commentary ranging from the origins of sportboats, catamarans and offshore races like Cowes-Torqay and Around Long Island to the state of the Miami boating industry in 2018 mixed in with some beer-drinking and women-chasing accounts. Brownie also doesn’t hesitate to give his opinion on a variety of subjects, including building boats for fun and profit, the days before Aronow became a God and that today’s center consoles with huge power aren’t that safe. But I won’t give it all away here—that’s the offshore racing Hall of Famer’s job in his book. 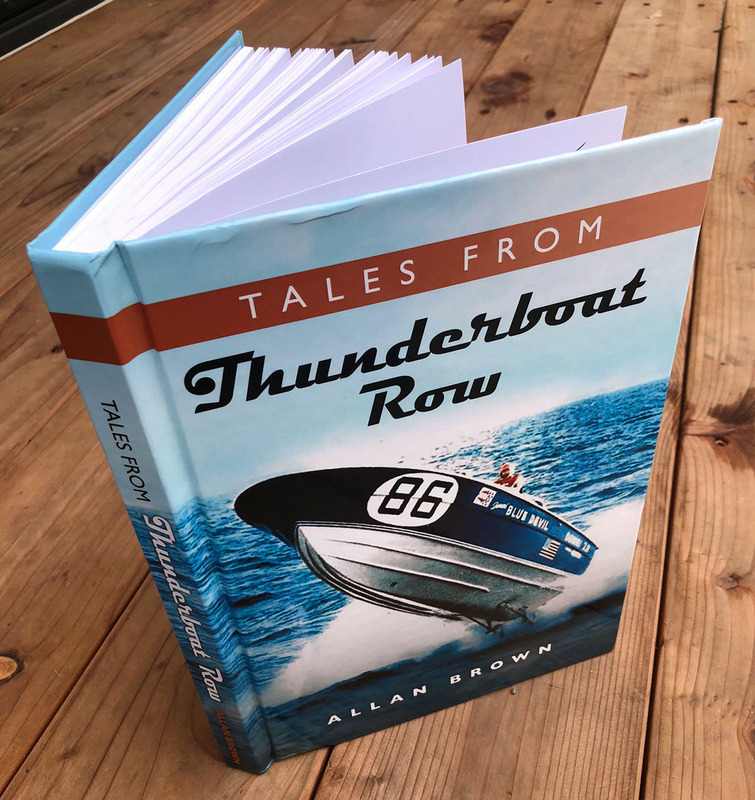 With a foreword written by none other than racing legend Rich Luhrs, a longtime friend to Brownie, copies of Tales From Thunderboat Row are available on Brownie’s website for $100 each, including shipping. If you’re lucky—or just ask—he’ll even include a hand-scrawled dedication. Half-jokingly, he said dirty or clean notes are available by request. Of course they are. How do I keep wingnuts attached to battery terminals?